Last post I promised to show you how necessity prompted me to create an impromptu embroidery frame that supports itself, has a large working surface, and allows me to embroider with both hands at once. Here she is. Meet Sophia*, a former footstool, now the perfect portable embroidery frame for light, loosely woven fabrics. KEY NOTE: this will NOT work for stiff or tightly woven opaque silks, because every pin used to attach the work to the frame will leave a pinhole that is essentially permanent, unless somehow you can massage each back into place or hide them with trim. *Named in honor of a friend's granddaughter. How is she made, you ask? It's dead simple. Let me show you. 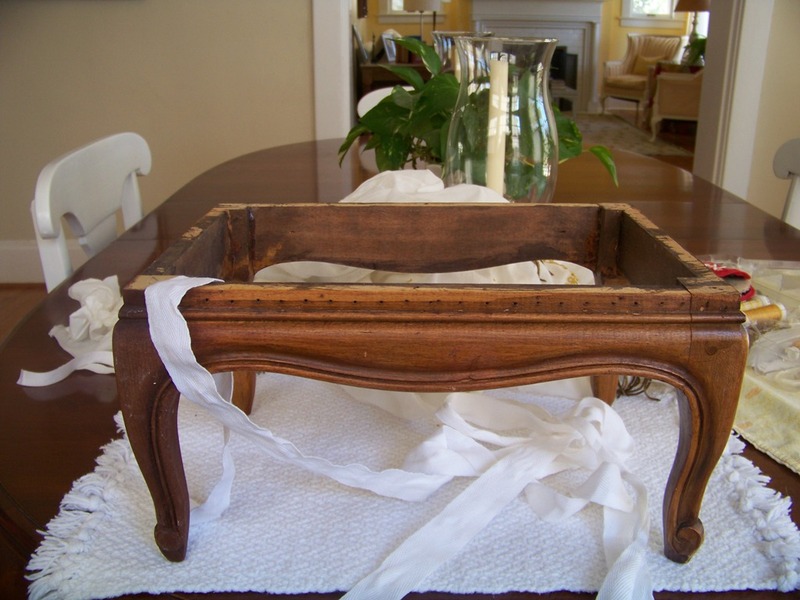 Get yourself an old footstool. It should have no sharp edges anywhere, no scrapes or dings that can catch at fabric or embroidery. Take off the top so that you are left with just the frame. Then possess yourself of yards and yards of cotton tape (I get mine from William Booth, Draper), or tear up old fabric into long strips and make one continous strip of them. 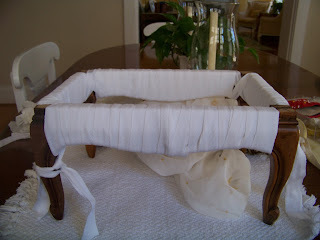 Now, wrap all sides of the footstool in the tape. Wrap as tightly as you can, and wrap the stool in two layers. You want a tight-but-soft surface into which you can stick long pins to hold your work in place. Tie the ends of the tape or fabric in place with half knots. Done! Starting to wrap the footstool. 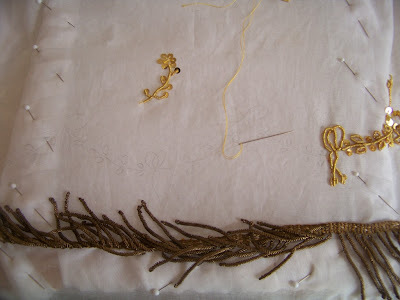 Stretch the fabric to be embroidered over the surface of the frame. Then at intervals of an inch or so, pin the fabric to the tape. Smooth and tighten as you go, repinning if neccessary, and yes, it's usually neccessary to tighten a few pins. In the image below the white-headed pins have secured the work to the frame. attached to the embroidery frame. ﻿﻿﻿﻿﻿﻿﻿ Here is the frame at work. I am setting spangles with silk thread. One hand is beneath the frame; you can just see it through the fabric, which is very sheer. The right hand is on top. In the top left corner I have set the spangles on a needlebook so that I can just pick them up one at a time with the needle. The cotton has a nap so that the spangles sit in place. Purl sits well there too. I'd like to make a velvet dish like goldwork embroiderers used to use, but haven't. I can work just about anywhere with this frame: at a table, with it set on my knees on a chair, or set on my legs when sitting on the floor. The rest of the petticoat just floats around the frame. I am careful to keep the area clean, and watch for affectionate cats who want to lie on my efforts! When I found the footstool years ago, it had a plywood top slapped on with brads, and a thin foam pad glued atop that, and the fabric cushion was missing. The footstool body was clearly handcarved and had a nice patina, and I was sure that some DIYer had put the skinny top on it, so I snapped it up at a garage sale price and brought it home, intending to recover it myself. Life intervened, and it lived for years holding books and sweaters in half-hidden locations. Enter the goldwork petticoat project. You should know that had I wanted to embroider this petticoat from the get-go, I'd have embroidered the fabric panels before making up the petticoat. That was the usual MO, then and now. I'd have used a version of the classic rectangular embroidery frame, as seen below in Diderot's Encyclopedia. The broideress sitting in the right of the plate is working on a man's waistcoat. For those interested, you can read Diderot's description of the various types of embroidery in his encyclopedia entries. 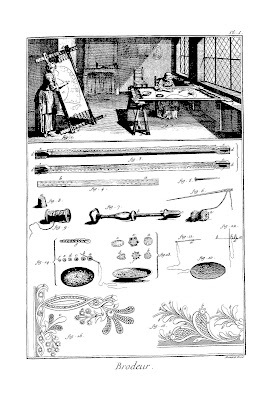 Brodeur, plate from Diderot's Encyclopedia. cannot find About Us page on the site. 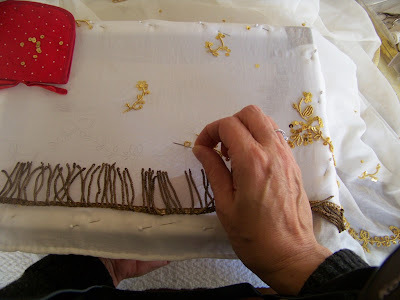 You can get embroidery frames today, but they are very expensive, and as you can see in the plate, one has to stitch tapes to the edges of the fabric and stretch the fabric with cords into a drum-tight surface. Not going to do that with a finished petticoat, am I? On this project I had first worked with an embroidery hoop, but such hoops limit your working area and will not work for continuous motifs like swags...you can't smash goldwork into the side of the hoop without utterly destroying it. No go there! Then I used a square frame that Dad made me ages ago to make thread table mats with. I wrapped the sides with cotton tape, and pinned the petticoat to it. It worked okay...that's what you see in previous posts, but the work area was small and I couldn't get my hands underneath since one hand had to hold the frame. The frame didn't fit into my old floor stand with clamp, either, and besides that thing is ugly. So, noodling about, I remembered master embroiderer Robert Haven telling me he made his own frames, and Norah from Nashville's antique hoop stand all wrapped in tape that I saw last fall at a tambour embroidery class, and I ached for something pretty, something with grace. And bethought me of the forlorn footstool. The rest is now history. If you are interested in traditional embroidery frames, they are out there. There are all kinds at verying price points, but before buying, I'd be sure to read up on them, at length. Some work better than others, and many, I'd say most, are not meant for the large expanses of fabric costumers use. See Mary Corbet's Needle 'N Thread for details. She is my current favorite Web source for things embroidery and she does careful reviews. Yahoo - finally some progress pictures! Your projects are always so very well thought and researched, it's such a pleasure to follow!!! Thank you! Really, you would be good at embroidery, what with your eye for detail and fearlessness about handsewing. This evening if I am fortunate, I'll do another motif. Meanwhile, we are outside in the warm, okay, warmish, springtime evening air, playing and relaxing. So brilliant! And your gown looks amazing too! Thank you both! It really was simple to do, a mere 20 minutes.